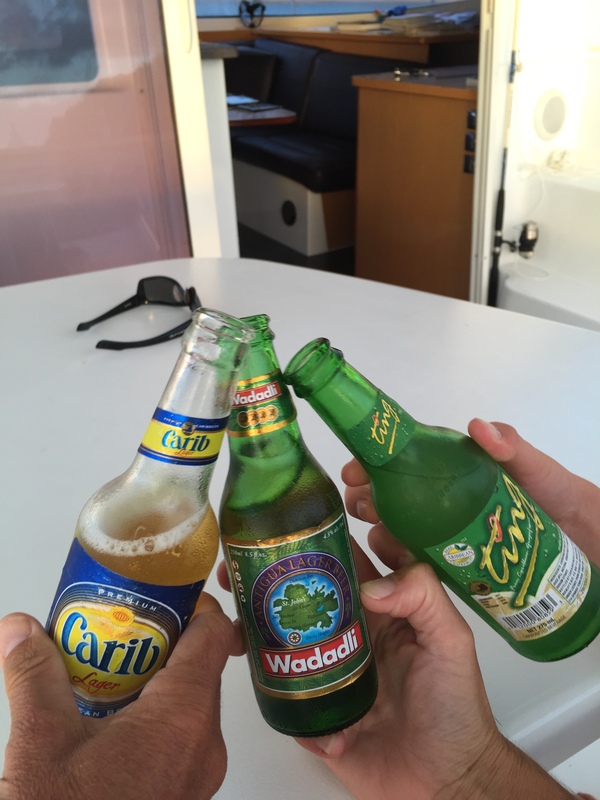 Up until now, Sarah, Jimmy and I have been able to do our island hopping during daylight hours. It’s been pretty easy—you point your boat at the next island after breakfast and usually arrive in time for lunch. 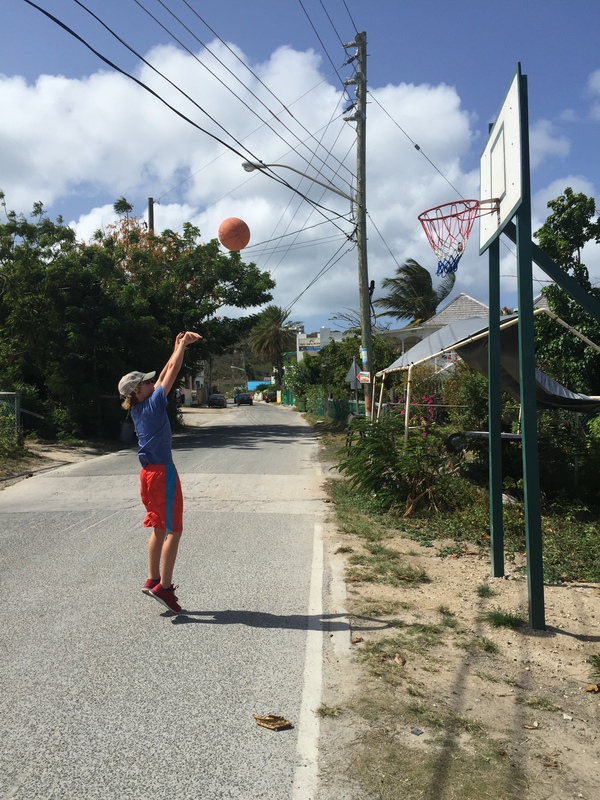 But the Anegada gap, a stretch of open ocean about 90 nautical miles wide between Anguilla and the British Virgin Islands, forces a change in that routine. 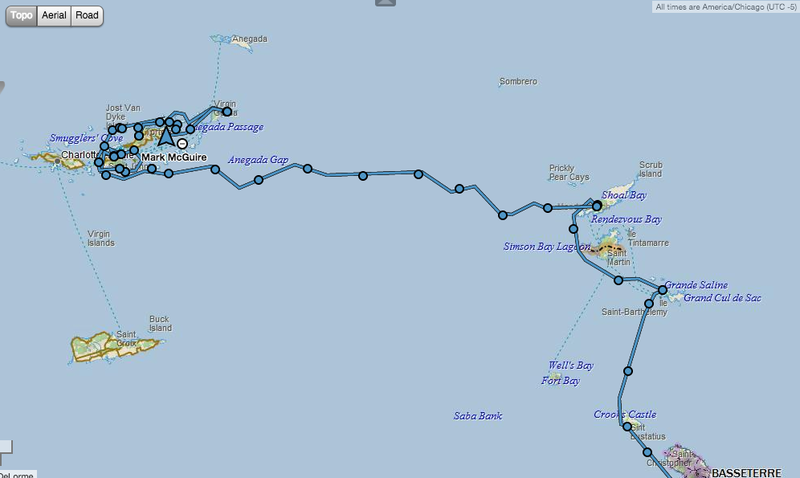 Assuming a safe average of 5 knots/hour, the trip across from Anguilla takes around 18 hours. Yep, we need to do this one in the dark. Night passage. In the sailors’ learning curve, this is a biggie. 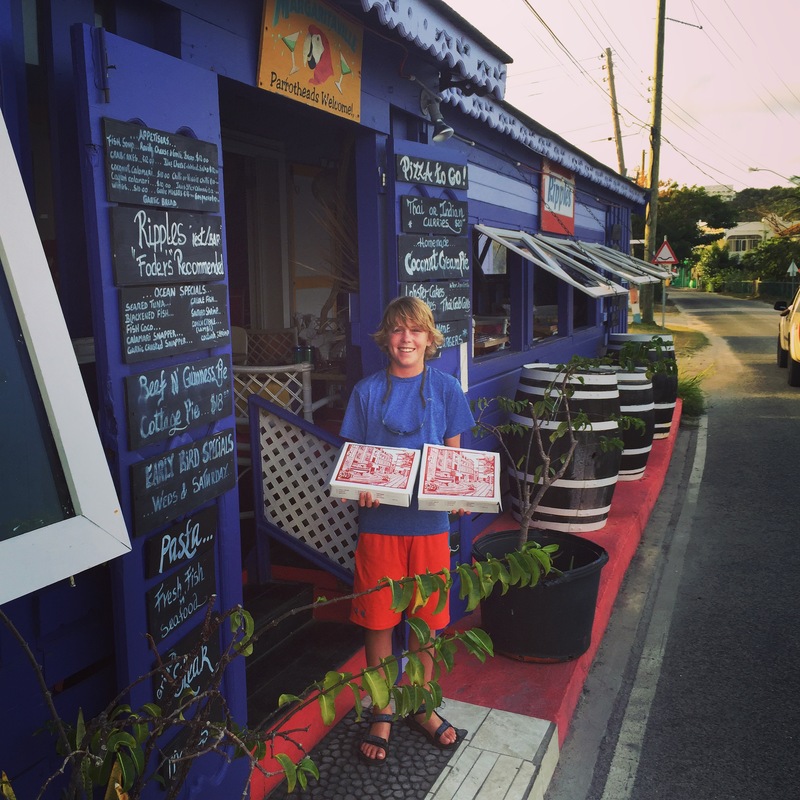 We spent the day bumming around Road Town, Anguilla, all of us a bit anxious for our 6pm departure. Batteries in headlamps? Check. 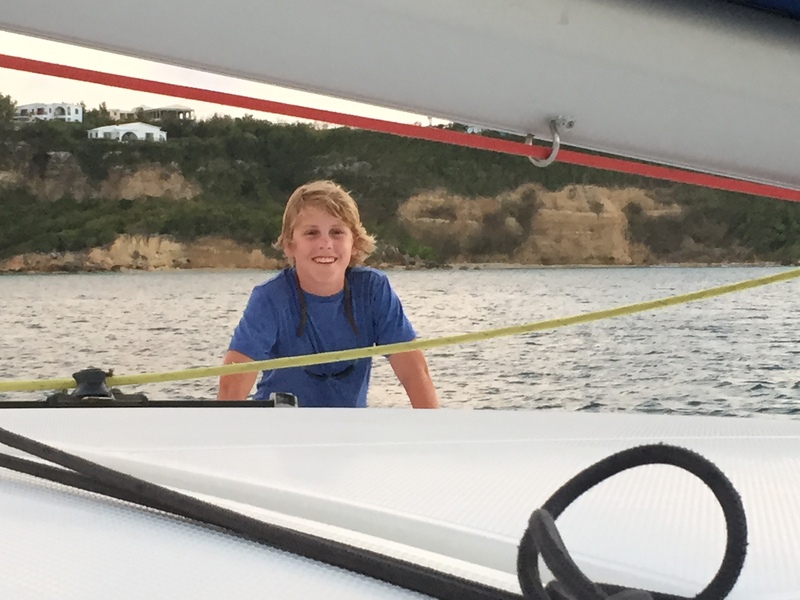 BVI waypoint entered in GPS? Check. Harness out and jacklines rigged in case we need to leave the helm? Check. Lifejackets out? Check. At 5pm, Jimmy and I grabbed take out pizza from town and Sarah got the boat ready and set up our sleeping arrangements in the salon for the night. I planned to stay up most of the night, but Sarah and Jimmy each wanted to do their own shift at the helm too. We decided that the other two would sleep in the main salon, within earshot of the helm in case something came up. We pulled up anchor around 6pm and started to make our way off shore. For a rookie, coastal sailor, pulling anchor at sunset is a strange and exciting feeling. Here we go. Into the dark. We quickly got our sails set on a broad reach and made some distance from the shoreline and its myriad fish nets, lobster pots, and other obstacles. We watched the sun set, and the stars slowly emerge. And then it got dark. And because there was no moon, it got really dark. It takes a long time for your eyes to adjust to darkness, and all of that hard-earned night vision can be ruined with one flash from a bright light. Because of this, we kept all of the lights off in the boat with the exception of our running lights at the top of the mast. The result was a feeling of charging headlong into the darkness, waves and unknown. Night changes everything. It is sort of like walking in the woods. Take a walk down your favorite path in the daylight and everything is relaxing and beautiful. But do that same walk in the pitch black of night and it’s a whole different ballgame. Every sound, every rolling wave, every big puff of wind felt a bit ominous at the start. Thus, the old colonial woman. 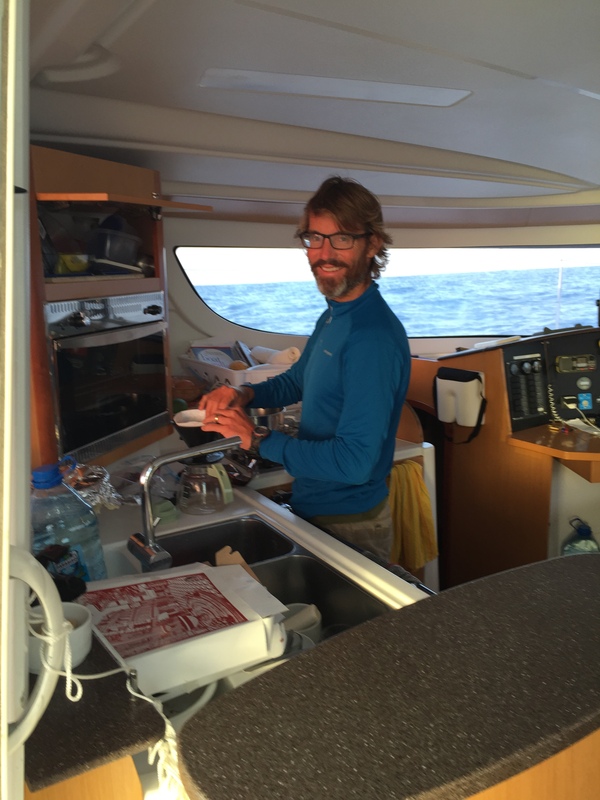 But as the hours went by, we started to get more comfortable and trust in the boat and each other. The conditions didn’t hurt our growing confidence either. 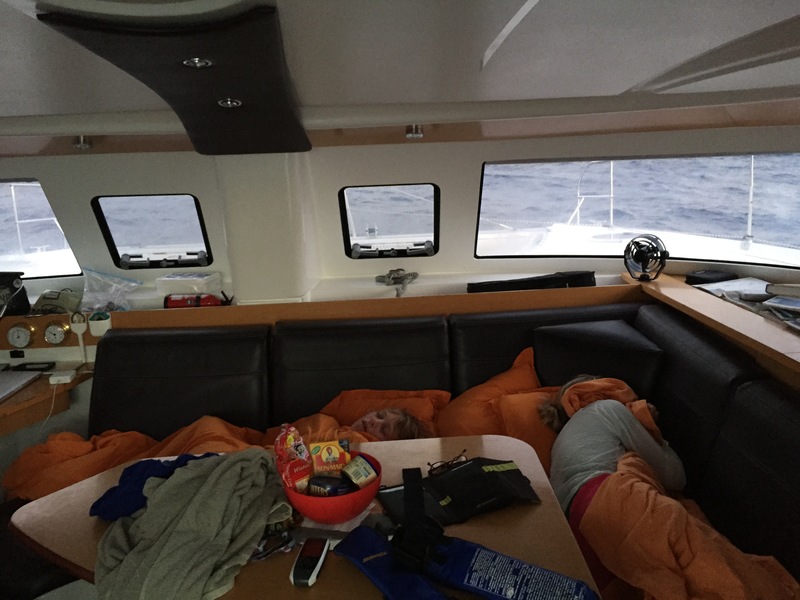 We picked a great night, with winds in the 10 to 15 knot range right behind us. It was a gentle ride down the waves, for which we were very thankful. Other than having to dodge a big tanker and a few other boats, the night was blissfully uneventful. And amazingly beautiful. We watched our boat wake light up with bioluminescence as we disturbed thousands of tiny organisms that fired off light in the water. It felt like we had giant sparklers attached to both hulls. Or like a whole new universe of stars had taken up residence below the water to mirror the Milky Way above us. Mesmerizing. The three of us sat there at the helm together, on and off for most of the night. Our own little self-sufficient world. The stars whirled overhead, the waves rolled, the earth spun, and we tumbled forward into the unknown together. It was a microcosm of this trip. 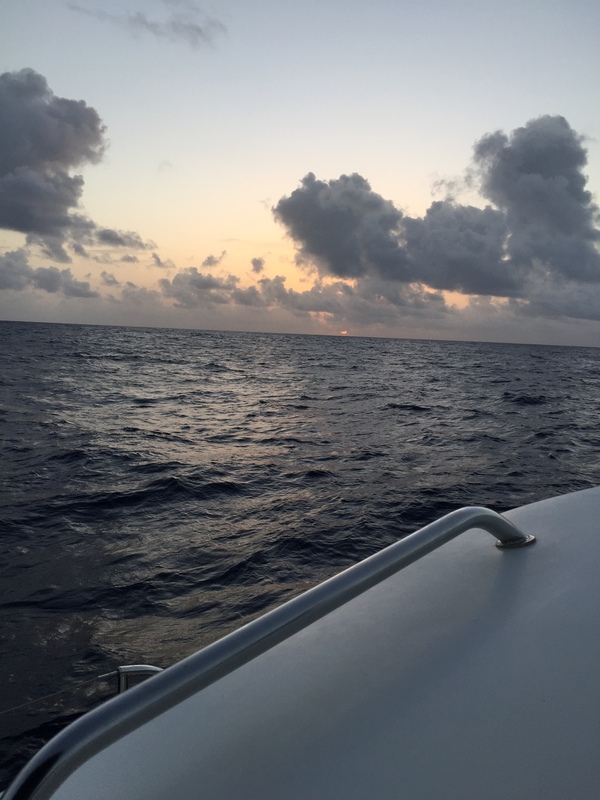 The sunrise saw Jimmy and me at the helm, still offshore and out of sight of land. I was taking over for him after his 4am shift and he wanted to watch the sun come up with me. I was so proud of him. When I left him at the helm at 4 and went to bed, it struck me that this was the very first time in my life that I fully, 100% trusted him to take on a very adult responsibility. Jimmy’s got this, I thought to myself as I fell asleep. And he did. It’s amazing what young people can accomplish when given the responsibility. It’s something I’ve learned on this trip and want to take back with me. Sarah got up a bit after Jimmy went back to sleep and we made coffee and fired up the engines to gain a little speed as we were still several hours from dropping anchor (yep, it was that calm). What can I say about Sarah? This is a woman who was terrified of the open ocean just a few short years ago. And now here she was, sitting next to me completely at ease and loving the moment. 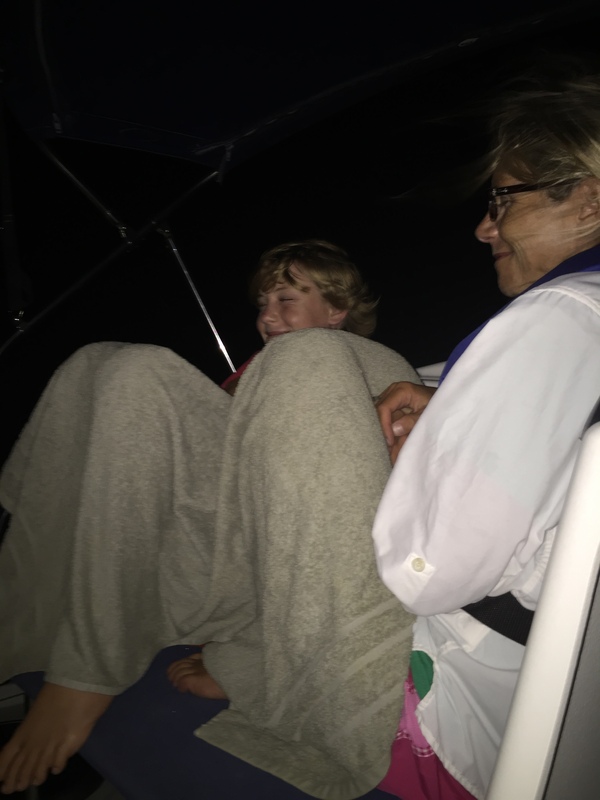 Sure, she had her bear spray ready last night in case we had “marauders” by the boat, but she was enjoying this moment and the feeling accomplishment. I felt so thankful that she trusted me to do this trip. There are many ways to be rich in this world, but I think that being in love with your spouse has to rank up there as the most important kind of wealth. That the light in her smile, the way she smells, and her warm hug makes me feel much the same way it did when I met her over 25 years ago. What a blessing. 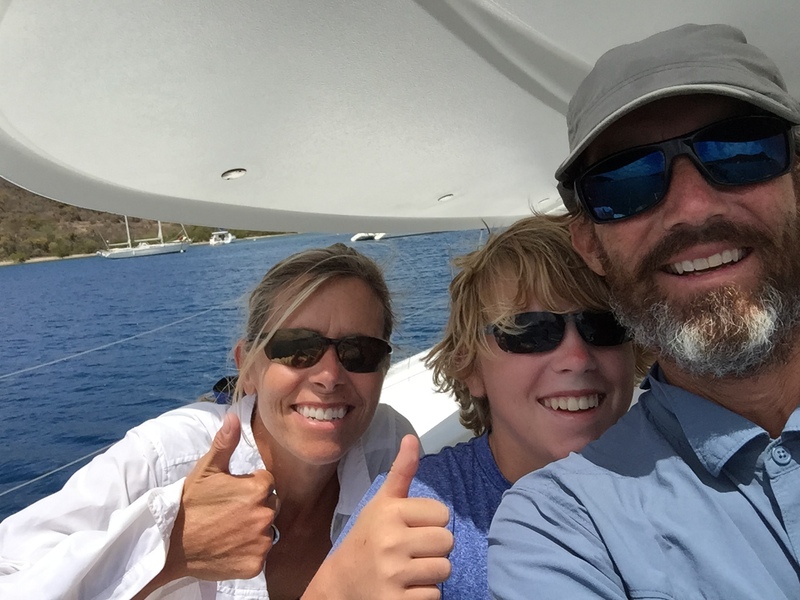 We (finally) grabbed a mooring ball in the Bight on Norman Island around 1pm. A very slow and very amazing 19 hours at sea. We had passed our test and had taken a big step on our way to becoming sailors. And we now get to enjoy the calm waters of the Virgin Islands. I’ve flown here from the U.S. many times, but this arrival felt much different. It was earned together with my family. Is there a better way to travel? Congratulations all, from Marni’s mom! Have been really appreciating your writing and photos. Sent Mark’s Edgewood address to Kris’ oldest (AJ, UW sophomore) for inspiration and advice. You made my day Nancy. Thanks SO much for the positive feedback. I’m so glad you’ve enjoyed reading. Please have AJ follow up at my gmail account – markjmcguire at gmail. And say hello to Marni for us.